Here at Wareable HQ, we change the devices on our wrists about as regularly as our clothes, meaning there's an ever-changing ferris wheel of devices doing the rounds and making their way through our testing. And through our new weekly column, What I'm Wearing, we're offering a peek behind the curtain at, well, what we're wearing. Think there's an accessory, watch face or wearable that we should check out?Drop us a line at [email protected], and it could end up featuring in a future edition of What I'm Wearing. From of the pile of new Fossil watches from CES, the Skagen Falster probably garnered the most attention. 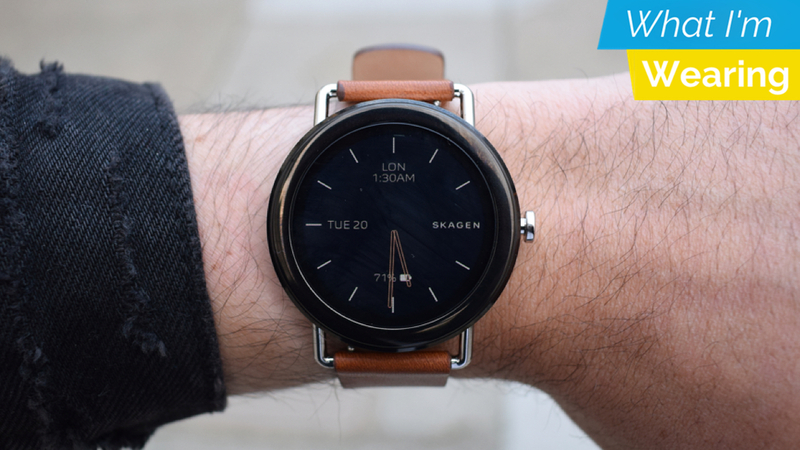 I think the case design is a little uninspiring if I'm honest, but paired with a tan band, I've got to admit I'm starting to understand the interest in Skagen's first full smartwatch. Remember when we first saw the original Moto 360 all those years ago? This is exactly what I'd hoped that watch would be at the time, a circular smartwatch that doesn't weigh down the wrist. The 42mm case has only a little bezel and there's a single button on the size, though sadly rotating it does nothing. I'm using one of Skagen's own analogue watch faces, tweaked with tan hands to match the strap. At CES, Fossil told me that Skagen's angle on the Falster is simplicity and mindfulness, with faces that do a better job of filtering the endless slew of data. The faces are certainly very minimalist, and while I can't say I necessarily feel calmer (I've only been wearing it for a day; full review coming soon), I appreciate what Skagen's trying to do. I do like to keep my eye on the time in London, where my colleagues reside, so I keep that on the face, though seeing the battery life is already inducing some anxiety; maybe I'd best take that off. We've already highlighted a few watch faces for the Fitbit Ionic, but with the smartwatch's ecosystem growing by the week, there's plenty to keep delving into. Generally, I'm a fan of the Ionic watch faces (or clock faces, as Fitbit calls them) that give you everything at one glance. I don't want to have to tap through a few screens just too see how many steps I've taken, and that's where the Arrows watch face comes in handy. You get everything you need here: digital time, date, heart rate and even the battery, to keep you from swiping to the right every time you want to check it. Plus, you have four arrow-shaped icons, each with a different colour, highlighting your progress within steps, active minutes, calories and distance. Feel like you're missing out on something? Well, within the Fitbit dashboard, you can customise which metrics sit in the arrows, as well as the colours of the arrow segments and background. You'll have to create an account with Lignite, the developers behind the face, and pay $1.25 (or $4.99 for Lignite's entire collection) if you want to keep it beyond the 24-hour trial, but this is up there with the best we've tried out on the Ionic so far.